Introduction: There are many reasons why some countries in the world are affected by poverty: Lack of natural resources or natural disasters such as drought and earthquakes. Other reasons are influenced by people: civil war; foreign companies profit from the country’s natural resources so the population does not share in the wealth of the land (which is often not the fault of the government). LEDC: A country lacking sufficient economic development to lift people out of poverty. MEDC: A country where economic development allows people to enjoy a comfortable standard of living. This map shows how a country’s geographical location can affect its wealth. This may be due to climate and also whether it has been blessed by Allāh with natural resources (as Muslims believe). Countries in the Middle East and Central Africa have a very hot and dry climate. This climate normally leads to poverty because people have difficulty in growing crops, feeding themselves and their cattle due to extreme heat and lack of water. However, because some countries have large reserves of oil, they are extremely wealthy. Saudi Arabia has 25% of the world’s oil discovered so far. Saudi Arabia (an MEDC) is separated from Sudan (a LEDC) by a relatively narrow stretch of the Red Sea, yet Sudan is a poor country. However over the last few years, the economy of Sudan has been growing quickly – that is because since 1999, Sudan has been exporting oil – and that has encouraged the growth of light industry and trade with other countries. Sudan has the 17th fastest growing economy in the world. As a result, infrastructure, such as roads and pipelines, has developed and the country’s rich mineral deposits are being mined and traded. However, China, Malaysia and India each have large stakes in the oil industry. The Sudan National Petroleum Company owns just a 5% stake in the biggest oil company drilling oil in Sudan. Therefore, much of Sudan’s oil wealth goes overseas rather than staying in the country. Despite this growth in Sudan, they’ve suffered a civil war, and they have a harsh climate and regular droughts – all this leaves the people very poor. They can’t get crops to grow in dry and bare soil – and if they grow, they depend on the rain to continue falling. So these economic developments still leave Sudan as an LEDC. The average life expectancy in Sudan is 57 for men and 60 for women. In Saudi Arabia it is 71 for men and 75 for women. Politics: Both countries are predominantly Muslim, yet Saudi Arabia and Sudan are run in different ways. Saudi Arabia has a stable government that is led by a King (King Salmān Ibn Abdul-Azeez), who oversees a constitution based on Sharee’ah Law. There are no recognised political parties or elections and most of the citizens of Saudi Arabia seem comfortable with this situation. The government of Sudan is based on the authority of a democratically elected president, but it lacks the stability of Saudi Arabia. For 25 there has raged a civil war between the Muslim Arabised North, and the Christian African South. Two million people died before a peace deal was signed in 2005. In 2011 South Sudan became an independent (Christian populated) country – which has since started fighting within its borders amongst various South Sudan Christian factions. Alongside that, the Darfur conflict in western Sudan began in 2003, which has cost over 200,000 lives and 2 million refugees. There have been reports of “ethnic cleansing”. This means the systematic killing and expulsion of one race of people by another, for reasons based purely upon race or nationality. Note: Ethnic cleansing also took place in the heart of Europe from 1992 to 1995, when hundreds and thousands of Bosnian Muslims were systematically killed, or placed into “concentration” camps where they were tortured, starved and killed by Serbian militias. Ethnic cleansing: killing or expelling a certain group or race from a country or region. Race: a group of people with the same ethnic background. 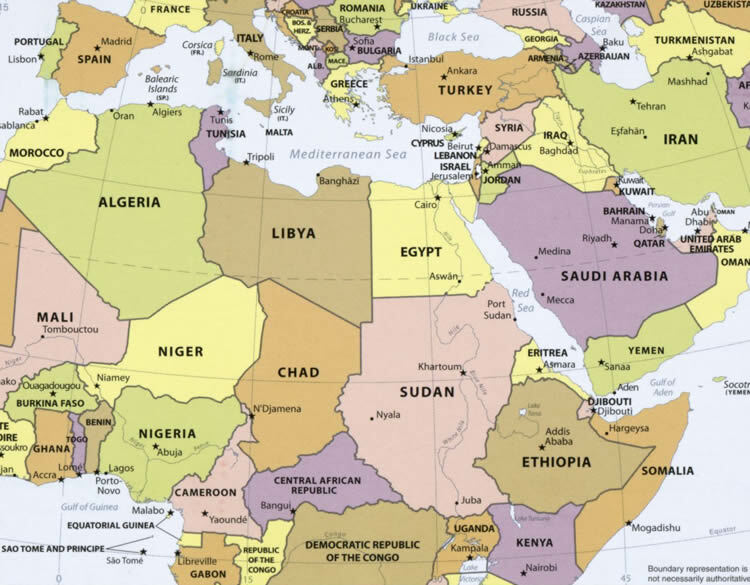 Research activity: Find out where Saudi Arabia and Sudan are in the world. Use an atlas or the internet. Exam tip: You do not need to have a detailed knowledge of these countries but studying them will help you understand the issues. Summary: You should now be able to discuss some of the reasons which may cause a country to be rich or poor and understand that whilst some causes are natural, others are caused by people. Questions: 1. Draw a table like this. Research information about the two countries (some you will find above). Then add the facts. Find the causes of poverty in this worksheet. List them and decide whether they are natural or caused by people. You may decide that some are both natural and caused by people. Can you think of any other causes of poverty? Which of these causes do you think results in the greatest poverty? Explain why? I initially compiled these worksheets for my students at the Redstone Academy (aged between 13 and 16 years), Moseley Road, Birmingham, UK who are working towards their General Certificate of Secondary Education (GCSE). I felt that others who do not attend the school can also benefit from these topics since they are presented in simple bitesize chapters. I have relied upon GCSE text books (especially AQA Religious Studies) and adapted them for my classes.